How should Southeast Asia think of China, and how do the Chinese think of this region? Lu Gang opened his speech with a refrain: Yes, he had come to offer insights, but China is a large, diverse, country, so do not expect to understand it. Foreigners who have spent time in China often comment on a similar phenomenon — that the longer they spend in the nation, the less they understand. This is not a criticism, just an acknowledgement that China has 1.4 billion people, it moves very fast and it has grown into a technological powerhouse. During his talk at ORIGIN by TechNode at SWITCH 2018 Lu wanted to give the Singapore audience an up-to-date understanding of the China startup ecosystem. Lu is particularly well placed to discuss this matter because he is the Founder and CEO of TechNode, China’s top English-language tech publication. e27 also sat down with Lu to dive a bit deeper into the Chinese ecosystem. Let’s take a look at some interesting takeaways. For the past ten years, China’s tech industry has been dominated by Baidu, Alibaba and Tencent. Lu explained that for Chinese startups, they can find success and raise a Series A or Series B round, but eventually they will need to choose their path. Do I fall under the Alibaba umbrella? Or Tencent? “It’s the final destination. You have to do that. It’s really hard to keep independent,” he said. This has actually been a shift in thinking from the BAT giants, who five years ago would have built an internal team to kill a startup they viewed as competitive. Now, it is more about investment, acqui-hires and, eventually, full-on purchase. The result has been a “second generation BAT” (who definitely do not follow that acronym). Companies like Toutiao and Pinduoduo are billion dollar companies that have found immense success. They also have significant investment from Tencent. Ele.me, Zhong An Insurance and SenseTime hold a similar place in Alibaba’s portfolio. Arguably the two most successful non-BAT startups, Didi Chuxing and Meituan-Dianping, have investment from both.This chart from Bloomberg is an excellent visualisation of the dominance China sees from Tencent and Alibaba. Lu referred to these as unique, if you look at business models or innovation, but they are still related to BAT. They would be better thought of as younger siblings. The story of Chinese investment in Southeast Asia has been a core narrative over the past few years. Whether it is Alibaba buying Lazada or Tencent’s support of Go-Jek, many of the biggest stories of the recent past have involved Chinese companies. But how does China view Southeast Asia? “I think most people really believe that Southeast Asia is 5-6 years behind China. So what happened in China is happening in Southeast Asia. I think that’s the trigger for Chinese companies and VCs. For example, they want to find the next Alipay, or WeChat,” said Lu. It doesn’t hurt that, in general, Southeast Asian startups are open to Chinese money. One strategy for Chinese VCs is not to invest directly into Southeast Asia, but to help their portfolio companies get into specific countries. For example, if a Thailand company is offering a similar product to their Shanghai counterpart, it is reasonable to expect the Chinese company to invest a little bit of money into the Southeast Asian startup. The reason is because of the likely supply-chain or technology synergies. The reality is a lot of Southeast Asian components are sourced from China, so if a startup can leverage a local partnership via investment, theoretically the supply chain will be made more efficient. Then, maybe the Chinese company puts in a little bit more money, then a little more and then, maybe, an acquisition. Think of how the Alibaba/Lazada deal played out. The truth is, it is difficult, but not impossible. By the time an entrepreneur has figured out the market, three dozen companies have already passed them by. “I think if startups are only doing something like a market-driven company, I don’t think it is going to work in China. The market is different and you will be copied by the Chinese companies,” said Lu. However, China is desperate for unique technologies. According to Lu, this is where the gap still exists between Silicon Valley and China. For example, the Chinese sharing economy and payments infrastructure have largely surpassed their American counterparts. But in areas like semiconductors and intellectual property, Lu says China is still working to catch up. In part, understanding the relationship between China and Southeast Asia is why Lu came to SWITCH. “We just opened a small office in Singapore because we want to talk more with Southeast Asia. We want to power up the bridge between Southeast Asia and China,” he said. While there may be learning gaps from both parties, what is obvious is that both Southeast Asia and China want to learn from one another. 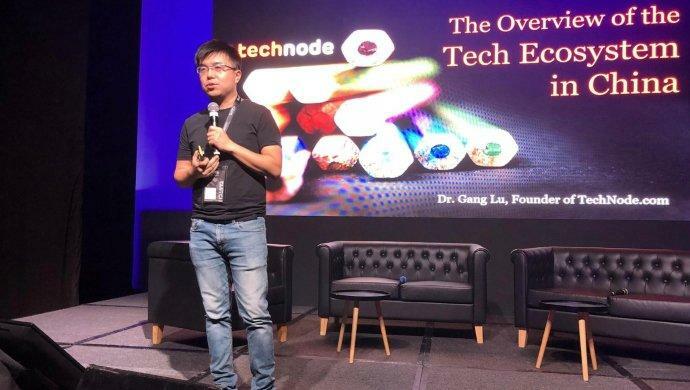 Dr Lu Gang was a speaker at ORIGIN by TechNode, an event held at the Singapore Week of Innovation & TeCHnology 2018. The post Insights into China from TechNode CEO Lu Gang appeared first on e27.